Oh goodness I am so tired! I left my grandparents' house at around 8:30 this morning, went picking with my mum (10lbs of blueberries and 30+lbs of peaches) then proceeded to spend the rest of the day making 9 jars of peach chutney 19 jars of peach jam and then helping Bill make however many gallons of his amazing tomato sauce to be canned tomorrow! I've just gotten back to Surry, it's 9:34pm and I'm off to a shower and a comfy bed. On the drive from my mum's to surry (about a 20 minute drive) I saw a white mouse, two hopping frogs, a cat and a hawk of some sort. :) This is all at night. I love the backroad drive with almost no cars, lots of turns and hills and trees and fields and air that makes you wish your lungs were bigger so you could breathe in longer each breath. He got his birthday package :) :) :) I love hearing him happy. I got to chat, text, AND talk on the phone with my husband, with lots of happiness, smiles, silliness, and most of all love. I made a tough decision to take care of myself rather than extend myself too far. Finally ordered a new compost crock and a couple of other things that have been on "get when money is a little looser" list. I made myself a dinner entirely from leftover parts of a few different meals from the fridge (plus an egg) and swiss chard from my garden. :D And I made a girly pink drink :) with lots of baby ice cubes. So now, I'm relaxed, tired, happy, and content. I just have to figure out how I'm rearranging my studio. One of my dear friends who's been away working in different states is back in the area. It is such a delight to have the option of hanging out in person. While we may talk a minimum of every few weeks or so, it is still lovely to have someone as fun as him to call up last minute and have playdates. The one I wrote about? 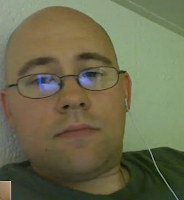 I have just concluded my first ever internet chat with my dear husband. Oh it is so good to be able to see his face no matter how far away he is. The past week has been very tough for me, but as that's not the subject of this blog, I'll move on. On the way home from spending a few days in Maine (the highlights of which are swimming, polar bearing, visiting with family and getting unexpected support from people I only see once a year or so) I had dinner with my mum. Yesterday, I was able to get local peaches, juicy and delicious, and my dear friend Diana moved in! It will be so uplifting to have her here, and such a relief to have someone looking after the place when I'm off adventuring. I posted this blog there but never posted here about the revamp of my website. Looks like the next few days are going to be pretty dreadful hot. Maybe I should go to New Hampshire. Fantastic visit over at Michael and Joy's house complete with flying dog chases, grilled fish caught by our host, lovely conversation, girlie time with accompanying manly time in the other room and just a wonderful night all together. You have two jobs with your daughter. The first job, which is the easier, and you'll mess it up along the way but you'll figure it out and it's still important is to teach her how to be in the world - how to blow her nose and cross the street and say please and thank you and all that. The second job is to teach her how to love herself. The man said that he then asked how he was supposed to do that. The mentor told him to love himself and let her see.